Looking out the window after lunch today, I noticed a large dark shape in our neighbors’ yard across the street. At first I could only see its back and thought it was a cat, but then it turned its head a little and I realized my mistake. I then ran back to my room, threw on some shoes and grabbed my camera in hopes of getting a picture or two before it flew away. By the time I made it out the front door, it had left its original position and flown up into a tree in the same yard. It’s times like these when I am thankful for the massive zoom my camera has. Starting at the front porch and moving about twenty feet closer at a time, I took a series of pictures of the hawk in the tree that got progressively clearer. Eventually, I made it to the mailbox at the end of the driveway, figuring I was getting lucky that it hadn’t yet flown away. I used the mailbox as a makeshift tripod for a few shots then decided to cross the street and press my luck farther. For some reason, the hawk jumped from the tree and soared down to the driveway, getting about twenty feet closer to me than it had been before. 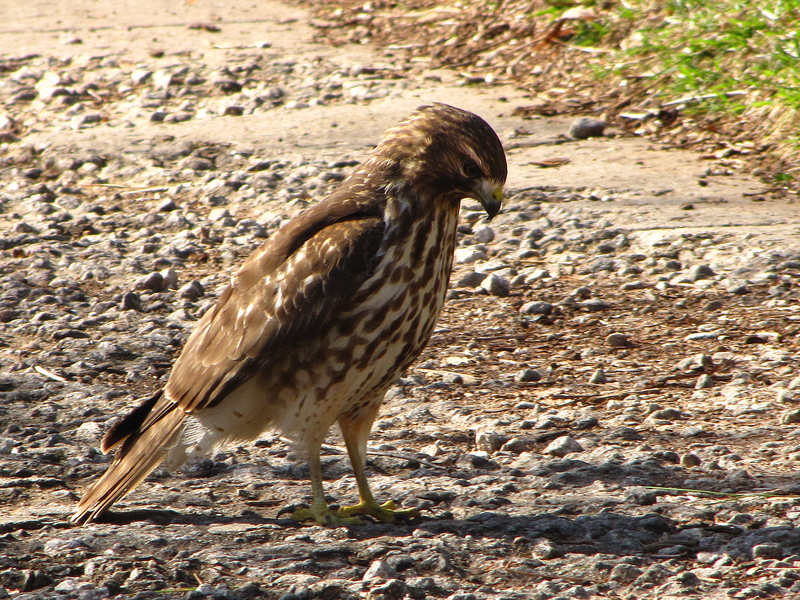 I’m glad I was able to react fairly quickly and get this shot, because after that a school bus drove down the road and scared the hawk away to the neighbors’ back yard. This is a slightly cropped down version of that one lucky shot, and given the amount of time I had in which to take the original, I am very pleasantly surprised with how it came out. First, I’m glad the focus ended up correctly, some of my shots from further away were not so lucky. I’m also glad that the camera chose a fast shutter speed for this one, as I know my whole body was shaking (a result of not grabbing a coat before heading out into the 30 something degree afternoon), and I ended up with a really clear shot of the hawk. After a little work cropping the original shot, I’m really happy with the composition of this photo. I got the hawk pretty much centered vertically, but pushed off to the left of center horizontally. By doing this, I was able to include a little more of the shadow it was casting out in front of itself, which I really liked. It seems like the hawk is just staring down at its own shadow. If I had to assign an emotion to that face staring down, it would be an intense determination, with maybe a little bit of curiosity thrown in as well; but I’m certainly no expert on the emotions of birds of prey. All in all, I feel like this is one of the better stories I’ve had to go along with a picture in a while. I always enjoy writing about the context of my pictures, and it was a desire to share the stories behind some of my pictures that was one of my main reasons for starting this blog in the first place. Hope everyone’s having a great new year so far!